understood. I now own a partner steel stove and aluminum griddle, definitely HARD. I'm sure the piece I had wasn't quality. I was thinking of getting them to make me a Deep Fryer out of a griddle. use the same base and do a 4"-6" sides on it. 2 handles and done. Then I can do my frying and funnel cakes without issue. My Copper Core All Clad is working great, but, thats only a cake at a time. Would be nice to do 2 or more. I love my Lodge dutch oven. The weight doesn't bother me - I cook exclusively with cast iron at home. Aluminum liners are ok when cooking more acidic dishes (chili, stew, etc...) but not really necessary. I got this case from Blue Ridge Overland which holds the dutch oven, lid stand, gloves, and handle. Nice bag. Must be a custom Blue Ridge bag. They offered them on their site at one point. I saw it at expo east. He said he quit making them because it was too complicated. I pack two DO one fits inside the other. They are great for all meals and deserts plus there are some good cook books on here for free to download. This is true. DO cooks love to share their food, their recipes and their tricks for taking care of their ovens. Certainly not a bad group to get to know. If you ever get the chance to go camping with a DO group, go for it. That is one camp out that you will not get hungry at. mmmm just picked up a 16" dutch oven. Can't wait to try it out on a big group meal. 16? Now that is serious cooking! :chef: I found a 16" Lodge a couple of months ago at a military surplus store. Lodge quit making them so I decided to grab it even though I don't need it. Just today I gave my son his first piece of iron, a 10" deep Camp Chef. A new oven along with a bit of instruction, and a couple of easy recipes, should get him started on the right foot. Passing on the torch, good for you! Well finally popping my cherry this weekend. I just picked up a lodge 10 dutch oven and a chefs platter. Got plans for great breakfasts and dinners salmon, roast chicken, bacon, eggs, pancakes, cobbler, popcorn etc. 3 days of cast cooking only! Fully commited lol. Pics to follow. Well I have a 10" cast iron DO that I inherited from my grandmother of unknown origin with a domed lid so I will have to get a flat lid which I see are available. I have cooked with this unit at home in the oven and on the stove but not with coals. 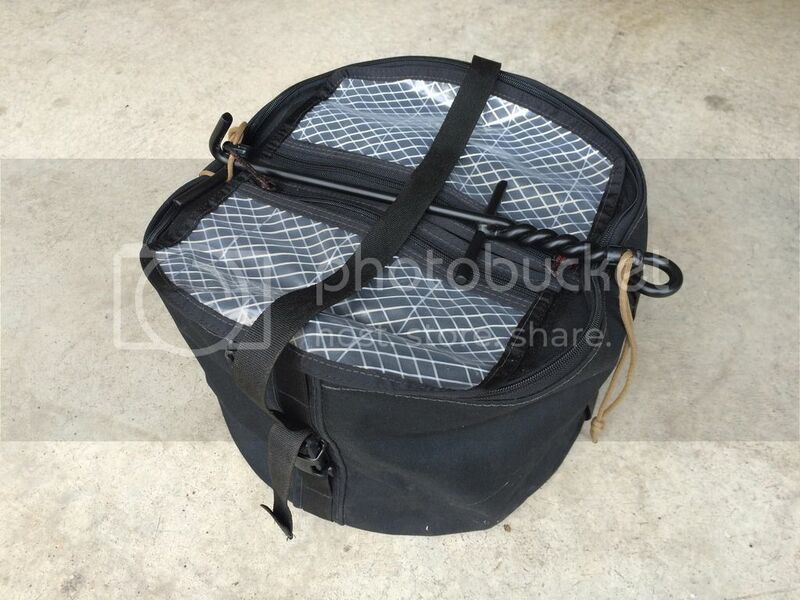 Sure would like to get one of those bags from Blur Ridge Overland but alas there is none on there site. Maybe with proper prodding we could get a group by going. I talked to them about that a couple of weeks ago. They stopped selling them on the site, but will still make them if you custom order it from them.